Can you really taste the difference between a $15 wine and a $150 wine? 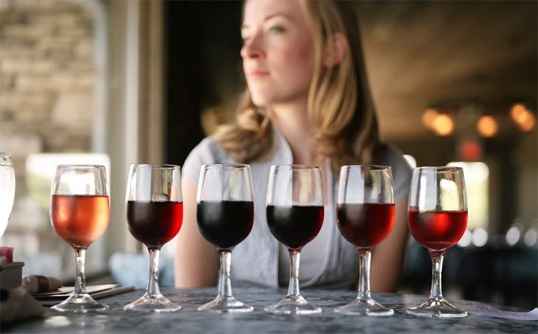 Wine enjoyment is such an objective experience and taste is not exactly an exact science. During a recent trip to Paso Robles I came face-to-face with my own shortcomings and the ugly truth of wine: much of what we taste is in our heads and not in the wine. I was traveling with a lovely group of wine journalists—each of us boasting some expertise in wine, some with fancy degrees behind our names and official titles. During a tasting at Still Waters Vineyards the proprietor poured two whites (the bottles were covered in brown bags) and asked us to try and discern the varietals. We all eagerly set to the task, using our infinite powers of wine-soaked observation to peg the wines being poured. Everyone loves a challenge. We swirled, we sniffed, we wrinkled our brows in contemplation. Some of us nodding with assurance. I took notes, finding the first white to be more floral and elegant than the second. Drawing on my years and years (there have been too many) of tasting, studying and observation, I swiftly concluded that the first wine was an unoaked Chardonnay and the second was a Sauvignon Blanc, easy peasy. Much to my mortification I was dead wrong, as was everyone else in the room. The proprietor chuckled and informed his room of bright-eyed ambitious wine journalists that the wines were actually the same wine; one was just warmer than the other. He wasn’t intentionally shaming us (not one person got it right); he was pointedly demonstrating the power of just one element in the wine tasting experience: temperature.